Here are some helpful tips from AAP Pediatrician David Hill, MD, FAAP on starting your baby on solid foods. Remember that each child's readiness depends on baby's own rate of development. Can your baby hold his/her head up? Your baby should be able to sit in a high chair, a feeding seat, or an infant seat with good head control. Does baby open his/her mouth when food comes baby's way? Babies may be ready if they watch you eating, reach for your food, and seem eager to be fed. Can baby move food from a spoon into his/her throat? 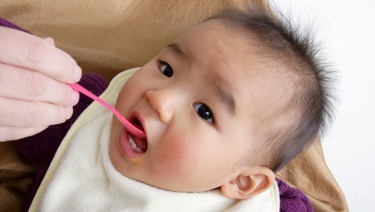 If when you offer a spoon of rice cereal, baby pushes it out of his/her mouth, and it dribbles onto the chin, baby may not have the ability to move it to the back of the mouth to swallow it. That's normal. Remember, baby's never had anything thicker than breast milk or formula before, and this may take some getting used to. Try diluting it the first few times; then, gradually thicken the texture. You may also want to wait a week or two and try again. Is baby big enough? Generally, when infants double their birth weight (typically at about 4 months of age) and weigh about 13 pounds or more, they may be ready for solid foods. NOTE: The AAP recommends breastfeeding as the sole source of nutrition for your baby for about 6 months. When you add solid foods to your baby's diet, continue breastfeeding until at least 12 months. You can continue to breastfeed after 12 months if you and your baby desire. Dr. T does recommend supplementing solely breast fed infants with vitamin D and iron supplements during the first year. Start with half a spoonful or less and talk to your baby through the process ("Mmm, see how good this is?"). Your baby may not know what to do at first. Baby may look confused, wrinkle the nose, roll the food around inside the mouth, or reject it altogether. One way to make eating solids for the first time easier is to give your baby a little breast milk, formula, or both first; then switch to very small half-spoonfuls of food; and finish with more breast milk or formula. This will prevent your baby from getting frustrated when he/she is very hungry. Do not make your baby eat if she/he cries or turns away when you feed baby. Go back to breastfeeding or bottle-feeding exclusively for a time before trying again. Remember that starting solid foods is a gradual process; at first, your baby will still be getting most of baby's nutrition from breast milk, formula, or both. Also, each baby is different, so readiness to start solid foods will vary. NOTE: Do not put baby cereal in a bottle because your baby could choke. It may also increase the amount of food & calories your baby eats and can cause your baby to gain too much weight. However, cereal in a bottle may be recommended if your baby has reflux. Check with your child's doctor if you suspect baby needs cereal. For most babies, it does not matter what the first solid foods are. By tradition over past generations, single-grain iron-fortified cereals have been usually introduced first. However, there is no medical evidence that introducing solid foods in any particular order has an advantage for your baby. Although many pediatricians will recommend starting vegetables before fruits, there is no evidence that your baby will develop a dislike for vegetables if fruit is given first. Babies are born with a preference for sweets, and the order of introducing foods does not change this. If your baby has been mostly breastfeeding, your baby may benefit from 1st baby foods made with meat, which contains more easily absorbed sources of iron and zinc that are needed by 4 to 6 months of age (beef, veal, lamb, pork, chicken, turkey, fish, etc). Check with your child's doctor. Baby iron-fortified cereals are available premixed in individual containers or dry, to which you can add breast milk, formula, or water. Whichever type of cereal you use, make sure that it is made for babies and iron fortified. Once your baby learns to eat one food, gradually give baby other foods. Give your baby one new food at a time every few days. Generally, meats and vegetables contain more nutrients per serving than fruits or cereals. Please continue foods already given as part of your baby's daily variety. There is no evidence that waiting to introduce baby-safe (soft), potentially allergy-causing foods, such as eggs, dairy, soy, peanuts, or fish, beyond 4 to 6 months of age prevents food allergy. There is scientific evidence for just the opposite_giving these foods between 6 & 10 months of age appears to reduce a baby's chances of food allergy bby allowing baby's immune system to develp tolerance to foods. If you believe your baby has an allergic reaction to a food, such as diarrhea, rash, or vomiting, talk with your child's doctor about the best choices for the diet. Within a few months of starting solid foods, your baby's daily diet should include a variety of foods, such as breast milk, formula, or both; meats; cereal; vegetables; fruits; eggs; pureed nut butters; soft cheeses; yogurts; soft biscuit pieces and fish. Please delay cow's milk until age one year and offer no honey in the first year of life. Once your baby can sit up and bring his/her hands or other objects to the mouth, and pick up small pieces with forefinger and thumb, you can give baby finger foods to help her/him learn to feed her/himself. To prevent choking, make sure anything you give your baby is soft (easily crushable between parent fingers), easy to swallow, and cut into small pieces the size of baby's thumb tip. Some examples include small pieces of banana, wafer-type cookies, or crackers; scrambled eggs; well-cooked pasta, rice and legumes; well-cooked, finely chopped chicken; and well-cooked, cut-up potatoes or peas. At each of your baby's daily meals, baby should be eating about 4 ounces, or the amount in one small jar of strained baby food. Limit giving your baby processed foods that are made for adults and older children. These foods often contain more salt and other preservatives. If you want to give your baby fresh food, use a blender or food processor, or just mash softer foods with a fork. All fresh foods should be cooked with no added salt or seasoning. Although you can feed your baby raw bananas (mashed), most other fruits and vegetables should be cooked until they are soft and then cooled, then refrigerated or frozen and dated until needed. Refrigerate any food you do not use, and look for any signs of spoilage before giving it to your baby. Fresh foods are not bacteria-free, so they will spoil more quickly than food from a can or jar. When your baby starts eating solid foods, baby's stools will become more solid and variable in color. Because of the added sugars and fats, they will have a much stronger odor too. Peas and other green vegetables may turn the stool a deep-green color; beets may make it red. (Beets sometimes make urine red as well.) If your baby's meals are not strained, baby's stools may contain undigested pieces of food, especially hulls of peas or corn, and the skin of tomatoes or other vegetables. All of this is normal. Your baby's digestive system is still immature and needs time before it can fully process these new foods. If the stools are extremely loose, watery, or full of mucus, however, it may mean the digestive tract is irritated. In this case, reduce the amount of solids and introduce them more slowly. If the stools continue to be loose, watery, or full of mucus, consult your child's doctor to find the reason. Babies do not need juice. Babies younger than 12 months should not be given juice. After 12 months of age (up to 3 years of age), give only 100% fruit juice and no more than 4 to 6 ounces a day. Offer it only in a cup, not in a bottle. To help prevent tooth decay, do not put your child to bed with a bottle. If you do, make sure it contains only water. Juice reduces the appetite for other, more nutritious, foods, including breast milk, formula, or both. Too much juice can also cause diaper rash, diarrhea, or excessive weight gain. Healthy babies do not need extra water. Breast milk, formula, or both provide all the fluids they need. However, with the introduction of solid foods, water can be added to your baby's diet. Also, a small amount of water may be needed in very hot weather. If you live in an area where the water is fluoridated, drinking water will also help prevent future tooth decay. Generally Metropolitan water is fluoridated and helps build strong teeth. Commercial bottled water is generally not fluoridated and does not build strong teeth, nor prevent tooth decay. Good eating habits start early! Encourage family meals from the first feeding. When you can, the whole family should eat together. Research suggests that having dinner together, as a family, on a regular basis has positive effects on the development of children. TV, cell phones and other electronics should be off and elsewhere during family meal times. Remember to offer a good variety of healthy foods that are rich in the nutrients your child needs. Watch your child for cues that he/she has had enough to eat. Do not overfeed! Babies will not eat the same amount every meal, nor even every day, but research shows babies will consume what they need from a healthy variety of foods offered them over a number of days. Babies feel hunger and they feel satisfied when full and need no encouragement to eat more than they want.